I am always amazed when something you want or need suddenly shows up. Is it just coincidence? Possibly. My experience with narrating audiobooks, however, tells me it’s not. I received an opportunity to narrate Facing the Wave: A Journey in the Wake of the Tsunami just weeks after my mom died in 2013. It would be my first audiobook, but I wasn’t sure that I had the mental fortitude to read out loud heartbreaking accounts and survivor stories of the devastating tsunami in Japan. My mom and I were extremely close. I am her only child and my parents divorced when I was young. Losing her after a yearlong battle with cancer devastated me. But I thought to myself, maybe this book came into my life for a reason. Could my own grief somehow help me connect with the text to be better narrator? Maybe I needed to learn from the people in this book, who found the strength to survive—after losing everything. That week of daily six-hour recording sessions was the most challenging voice work I’ve ever done. I was exhausted at the end of each day, but the work had a profound effect on me. Reading each page out loud helped me to feel the story more deeply. It gave me context and insight into the strength of the human spirit, precisely when I needed it. Fast forward to the end of 2015, two and one-half years later. 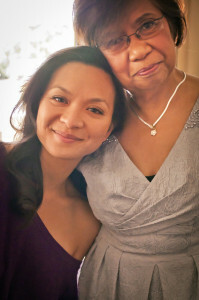 My mom’s passing still hurt, but the grief had given way to more solid footing and my heart felt a little lighter. However, the clutter I had managed to accumulate at home cast a shadow on everything. It wasn’t Hoarders-level clutter, but it was enough that I could feel a heaviness in our living space that I hadn’t noticed before. I tried to de-clutter many times in the past. Each attempt fizzled into failure. This time though, I knew I had to succeed, for my family’s sake and my own. I wished that someone could help me, or at least show me a new approach, because clearly, the old ones hadn’t worked. 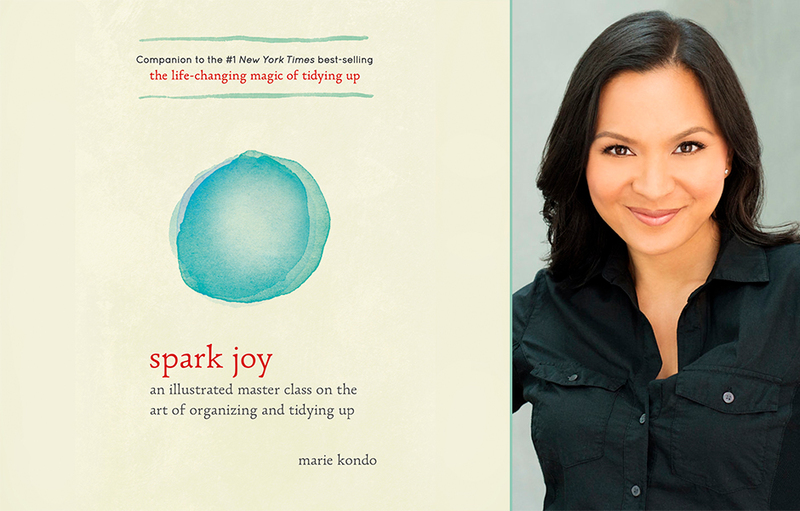 Two days later, my agent called me with an offer to narrate Marie Kondo’s Spark Joy. I didn’t know anything about it and hadn’t heard about the KonMari Method yet. But the title of the book alone made me want to say yes. I mean, what actor wouldn’t want to be a part of something that sparked joy in others? I did some research and after reading the glowing reviews on the KonMari Method, I couldn’t believe my luck. I was ecstatic that this book had come into my life! If I hadn’t been asked to narrate Spark Joy, I’m fairly certain that my zeal to change would’ve led me to skip chapters, going straight to those that I perceived to be most helpful. But narrating Marie Kondo’s book gave me the time to fully embrace it, from her clients’ concerns and hesitation, to her life-changing philosophy and storage tips. The day after I finished narrating the book, I jumped joyously into my own tidying marathon. I’m about one-third of the way through now, so I can’t share before-and-after pictures yet. But I can already feel the positive effects on my life. They’re subtle, but clear. I feel it in my outlook toward life, in my work, and in my relationships (particularly with someone I had a strained relationship with). The more I tidy, the more things feel like they’re shifting, in a positive way. Narrating Facing the Wave helped me through some of my darkest moments of grief, while reading Spark Joy felt like a kind, guiding light—both books coming into my life right when I needed them. Just a coincidence? Perhaps. But it makes me smile more thinking that it’s not. 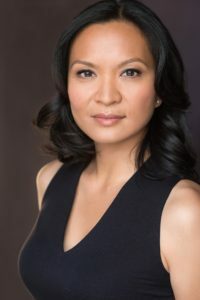 Sumalee Montano has guest starred on numerous TV shows, including Nashville, NCIS: New Orleans, Bones, The Mentalist, The West Wing, and ER. She is also an award-winning voice-over artist working in animation (Transformers Prime, Beware the Batman); video games (Dragon Age: Inquisition, Saints Row IV); and commercials. A graduate of Harvard University and a Fulbright Scholar, she worked as an investment banker before becoming an actress.